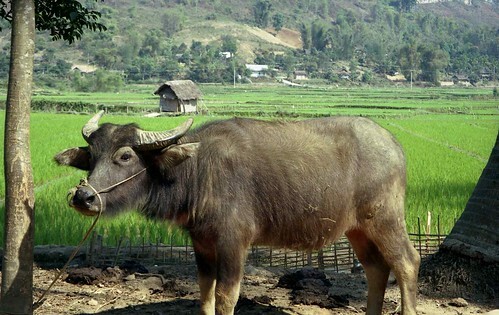 Young water buffalo and rice fields in Mai Chau (an ethnic Thai village), in Hoa Binh Province, northwest Vietnam. Household livestock production is set to become the leading form of livestock production in the country (photo on Flickr by Lon&Queta). ‘Household livestock production should be developed to reach a larger scale and higher professional level, participants agreed at a meeting on developing household livestock production on Thursday, in Ha Noi. ‘Addressing the meeting, Deputy Minister of Agriculture and Rural Development Vu Van Tam stated that household livestock production would be the leading form of livestock production in the country in the upcoming years. The objective of the meeting was to discuss policies needed for supporting the sector in the period 2014-2020. ‘Currently, there are some 12 million households in the country involved in livestock production. ‘Thus, a decision by the Prime Minister on such policies was of great importance as it encouraged the improvement of household livestock production by increasing productivity and lowering the prices of products, noted Nguyen Thanh Son, the director of the [National Institute of Animal Sciences] under the Ministry of Agriculture and Rural Development. ‘Those eligible for such support are households who raise livestock at a scale smaller than that of a farm according to criteria set by the ministry. ‘It is expected that once approved, the document will help tackle all the existing problems of the livestock production sector, including small scale production, low productivity, epidemics, and environmental pollution. The issue of low competitiveness will also be addressed. ‘According to the draft, farmers will receive a certain amount of money if they want to buy breeding livestock and can get their livestock vaccinated for free, which will protect them from certain kinds of epidemics. They will also receive financial support for building biogas tanks for animal waste treatment. . . .
Read the whole article at Viet Nam News: Household livestock farming set for growth, 15 Mar 2014. Tags: Viet Nam News. Bookmark the permalink.